Pressure washer electric models are suitable for areas where there is a constant need for cleaning dirty surfaces with necessity for their non-movement positioning. 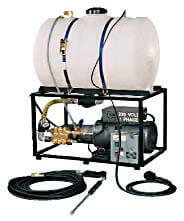 These pressure washer electric units may differ in size (28"x20"x13" to 40"x24"x47") and power (1500 to 3000 PSI). Heavy duty equipment contains a convenient quick change soap tip that can vary in angle allowing you to chose the amount of soap necessary for completing the job. The engines are totally enclosed and can have as much as 10 HP. The STAT models have a four bolt mounting plate underneath the motor and are designed to be mounted on a shelf for permanent installation. Do you need a pressurewasher for a two man operation? Choose a 208GE or 208STAT unit and you will get one powerful machine producing 2000PSI and 4 gallons per minute per each wand/user. Please call us at Toll Free 866-858-4982 and let us know you want a dual wand option. Note: Pumps have ceramic plungers with replaceable stainless steel valves, forged crankshafts, roller bearings in oil bath lubrication. In addition, they are protected by a ground fault circuit interrupter for operator safety. Water pumps can handle fluids up to 160 °F and therefore they are great for use in any place that requires warm water powerwash cleaning. All our base mounted electric powered pressure washer units come with a chemical injection for steady and even application of the cleaning solution, 50 FT of pressurehose for more freedom and uninterrupted work, professional trigger gun and wand for secure grip and smooth operation. GE Pressure Washer Electric Models - are securely sitting on the base of the motor.